Rodeo Beach reinvents the beach towel with this Parasheet Silky Beach Blanket. 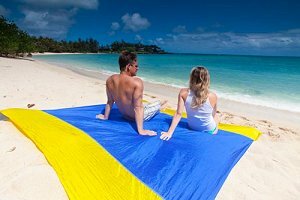 This beach blanket is made from parachute material rather than traditional terry towel, a silky fabric which ensures sand doesn't stick. That makes it pretty useless for toweling off once you emerge from the waves, but it does provide a soft, heat-resistant place to sit on the sand. This beach blanket is enormous at seven by seven feet, large enough to comfortably sit three or four adults. It's also incredibly light, weighing in at less than two pounds, far less than much smaller conventional towels. As it's so light it could easily blow away, but packing some sand into the corners should help it stay put. It also comes with complimentary camping stakes to help it stay on the ground when you're away from the shore. The Parasheet Silky Beach Blanket folds up into a small attached pouch for easy carrying once the sun starts to set. So many conventional towels are too big for beach bags, so it's refreshing to see this one folds down to around the size of a couple of soda cans. Rodeo Beach stands by its Parasheet Silky Beach Blanket and guarantees it won't rip or tear for ten years. It also won't develop mold or mildew, so you needn't worry about storing it away once fall rolls round. This Parasheet Silky Beach Blanket is easy to keep clean, as it'll happily survive a trip through the washing machine. For just $39.99, this is an affordable and different beach blanket. The Grand Trunk Parasheet beach blanket is a good alternative to this beach blanket.